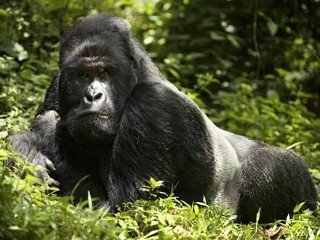 Nkuringo gorilla group is located in Nkuringo and it is the only gorilla family in this part of Bwindi Impenetrable National Park. You can book your accommodation at Clouds Lodge (Upmarket) or Nkuringo Gorilla Camp (Basic Accommodation). The drive time from Kampala to this part of the park is approximately 9-10 hours depending on stop overs you will make, weather conditions and the like. This group was opened for tourism in 2004. Nkuringo is the Rukiga word for round hill. The group was first spotted and targeted for habituation at a hill named Nkuringo. This hill is not peaked and can be distinguished by its rounded crest. In the first few months of contact with the group, the habituating trackers noted that it was under the leadership of an elderly silverback, who they naturally named Nkuringo. However, even then, Nkuringo’s son, Safari, had began calling the shots and, as heir-apparent, he had apparently taken over most of the leadership responsibilities. The aged Nkuringo died on 27th April, 2008, leaving behind two0 silverbacks in the group, Safari and Rafiki. This meant that the threat of a leadership showdown was expected. How did the situation resolve itself? Was there a battle of biblical proportions to determine dominance? Find out by ‘friending’ the silverbacks of the Nkuringo family to see how the situation was resolved.